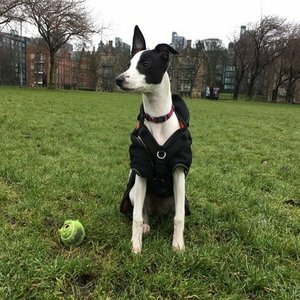 Stella, Queen of the Meadows, lives in Edinburgh and has two Whippet Slaves, Lee and Alan. She loves biting on sticks, eating things she shouldn’t and nibbling ears. She likes to run around the Pentland Hills with her pack during the week when her human slaves are at work and rewards them by smelling of horse and sheep when she comes home. Her arrival has tested the organisation skills of her human slaves and the GTD process has passed with flying colours. She hopes one day to meet her London NAA cousins, Jake and Mabel.